It seems to be clearing up now. Thank goodness! I can get back to uninterrupted painting again. I've made a start on the next batch of 32 figures as well. This group should paint up very quickly and I might be able to get them entered at the weekend. 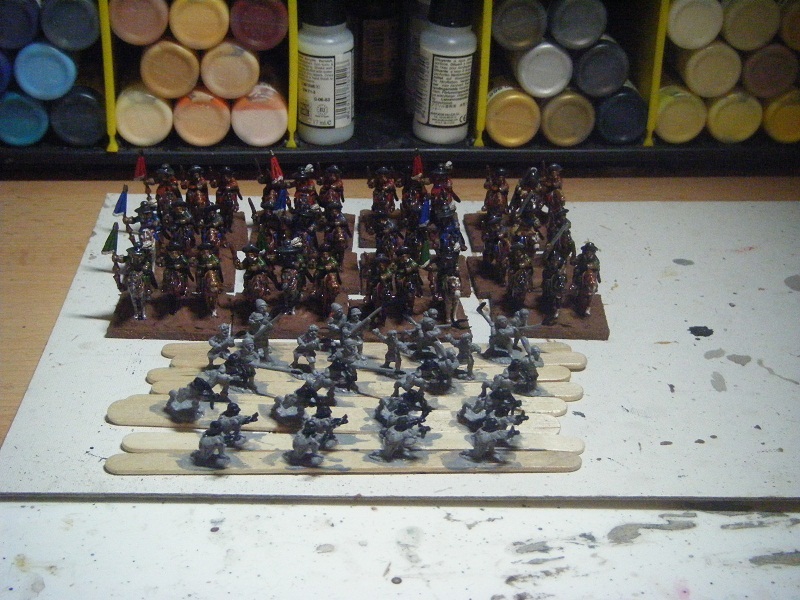 Then I can make a start on the final set of this initial tranche towards my medieval Swiss army. Tomorrow evening I will try to remember to post the pics from Usk. Challenge Entry #6 - 30YW "Horse"
And here are the very same pics! My 30YW army is already taking up nearly 3 foolscap file boxes, although I think there's enough space for the rest of the bits I have left to paint - unless I decide to do a contingent of Wallachian/Transylvanian allies or some more foot regiments! 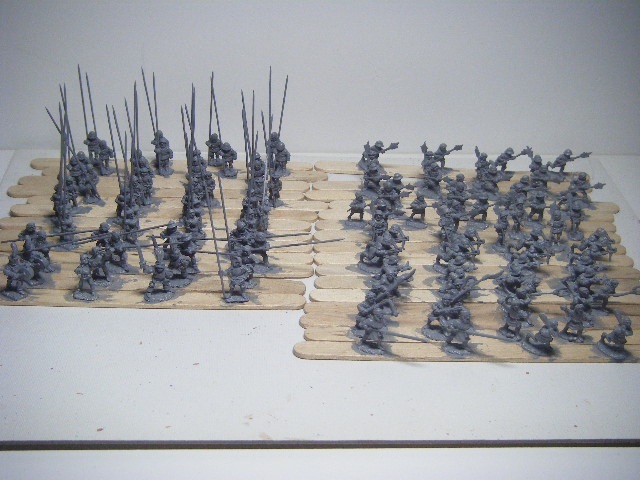 All that is (currently) left to paint are the Hakkapelliita, another unit of Harquebusiers, 6 artillery limbers and the casualty markers. My cough eased off yesterday (much to the relief of my ribs). Unfortunately it had merely transferred to my nostrils which were producing copious volumes of very watery mucous. Yuck! 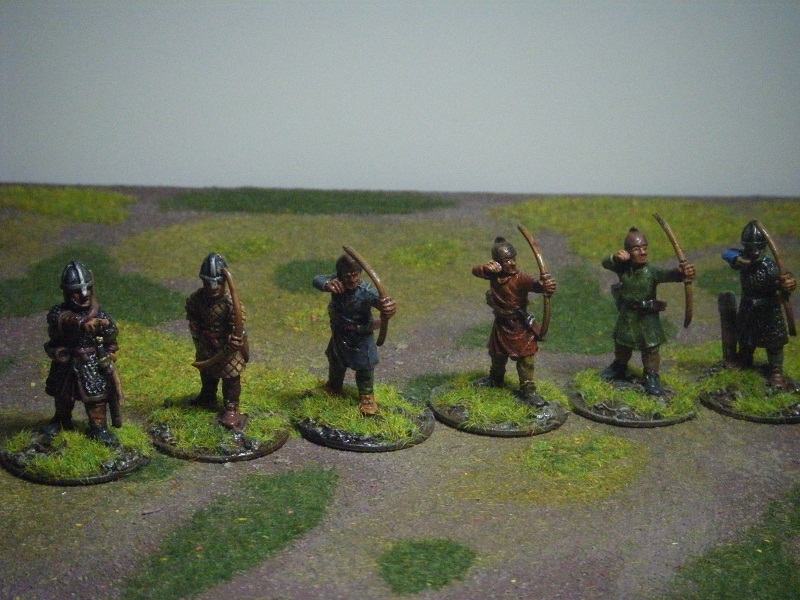 Naturally that made painting rather difficult - I'd manage to apply colour to a few figures then have to blow my nose. So, I didn't get a lot done. Today has been much better and I've been able to crack on and get quite a lot done. One batch of 16 are fully painted, the other 16 are a good way towards being done (and will be even nearer completion by the time I go to bed). I'm planning to base them up at the same time, hopefully tomorrow or Wednesday, then I should be able to submit them to Curt for Thursday. I just have to keep my fingers crossed that Fran hasn't been beavering away finishing off more stuff, so that I can leapfrog him on the Challenge points table! 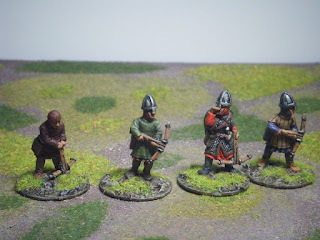 They've been up on Curt's blog for a couple of days now, so time to show them here - the 28mm Norman skirmishers from Conquest Games. Ray and Fran have been submitting big loads, which means I'm lagging behind them a bit. I doubt I'll catch Ray, but I might be able to overhaul Fran on the table! I didn't finish the 30YW horse or get any painting done yesterday - not long after I got to work I started feeling cold to the bone, achey and could feel a cough building. Not a cold for once, but my first "cough" for several years. I've managed to do the tufting & flocking on the 30YW horse today and a little bit of painting on some Swiss- just the undercoat and dry-brush of the metalwork and the flesh. Hopefully I'll be in a better state physically tomorrow and will be able to crack on with them. 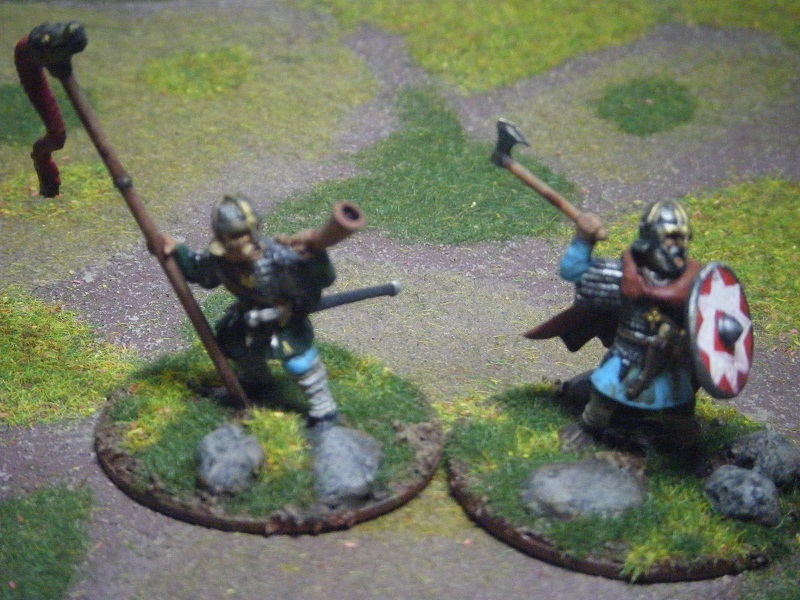 1) Basing was a mix of ballast and modeling paste. This proved much easier to deal with than PVA/ballast. 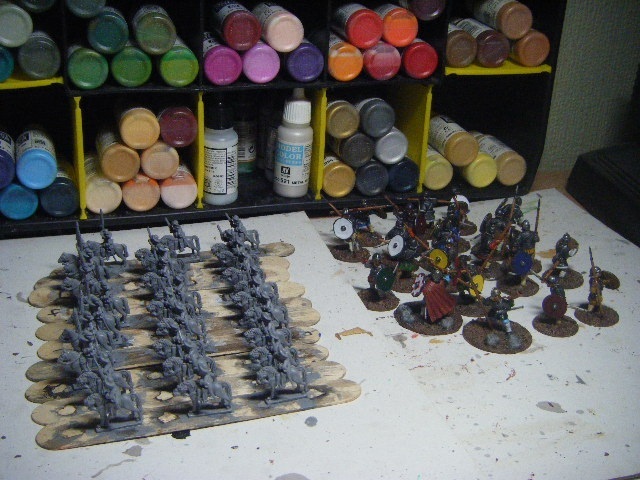 2) I primed them black then gave a heavy dry-brush of Iraqi Sand and a light dry-brush of Pale Sand to provide some pre-highlighting. The pre-highlighting seems to have worked quite well, much better than pre-shading (dark wash over white primer) that I've tried before. The Normans are finished and photographed now, and the pics have been sent to Curt - hopefully they'll be up on his blog in a few hours time. The 30YW horse are fully painted and have been based. I'm just waiting for the gunk to dry before dry-brushing it. Then in the morning I will brave the cold and matt spray them before work. That will allow me to tuft and flock them tomorrow evening. Hmmm, two 100-point-plus challenge entries in 2 days? Nicely done! 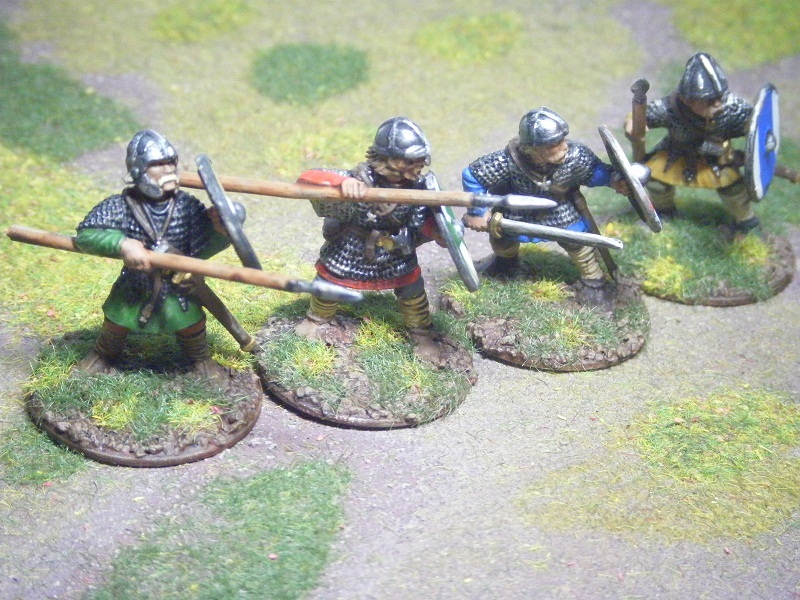 The figures on the painting sticks are the first of the 15mm Swiss I'll be painting up over the weekend. If I'm lucky I'll get them finished before Ray paints up anything else, and will leapfrog ahead of him and Fran! After posting on Sunday I prepped the extra 6 figures I need for my late 30YW horse and all of the Swiss. Luckily the Swiss had very little to clean up in terms of flash and mould lines, so it didn't take very long. I then put them to soak in warm soapy water overnight. Yesterday I rinsed them off, dried them and then stuck them onto painting sticks. 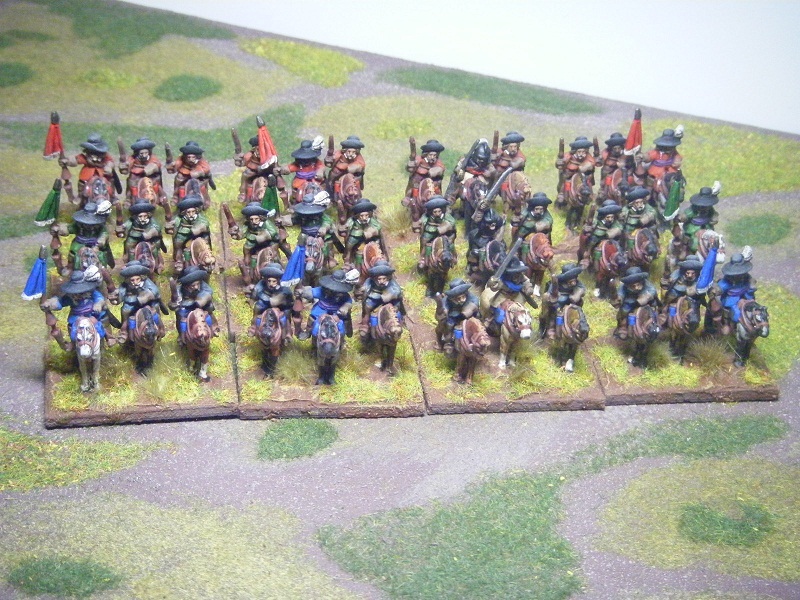 Once the PVA had set I superglued the riders onto the horses and pikes into the hands of the Swiss pikemen. A couple of hours later I primed them all with gesso. 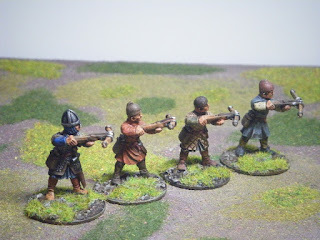 Today I managed to finish painting the Norman skirmishers and they have been given their Klear/ink coat. If I manage to get up early tomorrow morning, I'll be brave and throw the windows open so that I can do the matt varnish spray before heading off to work. That way I can flock the bases when I get home in the evening. 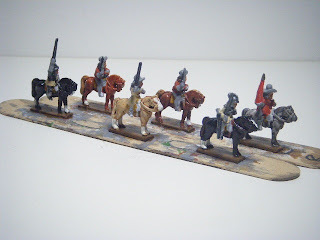 As there was nothing else ready to paint, I made a start on the extra 6 figures for my late 30YW horse units (2 troopers, 1 standard bearer, 3 officers) with the intent of getting them to the same stage as the 30 I was working on last week. I've managed to get very close and should be able to finish painting the whole lot tomorrow evening, but probably won't be able to get them based - that will need to wait until Thursday, then Friday should see them matt sprayed, flocked and tufted. Once all those are done it will be decision time - which of the Swiss to do first? 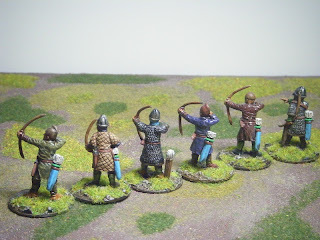 At the moment I'm thinking of doing the crossbowmen and enfants perdu as they should provide some quick points for the Challenge. Well, we made it to Usk safe and sound yesterday, and got home safe and sound a bit over an hour ago. The roads to Usk on Saturday were fine all the way, and we arrived in plenty of time to get settled in, have a chat with people and to grab a coffee before the start time for the third game. I also picked up my order from Donnington Miniatures. Simon and I managed to live up to the Central London club's motto - "It smacks of incompetence" - by achieving our target place of next-to-last by the end of Saturday's 2 games, only to drop back into last place on the Sunday. * they had 3 x 2-base BGs of Nelliephants! Horsey armies no likey! We had fun, and I have taken pics of all the games. I'll probably do a captioned picture AAR of all 4 games tomorrow or at some point this week. A plastic baggy, but what's in it? Some more plastic baggies and a piece of paper! The 6 extra figures (2 troopers, 1 standard bearer, 3 "officers"I've ordered to complete my late 30YW "horse"
I've decided to use one of the officers with the "Hakkapellita" and one of the Hakkapellita as an officer with the "horse". After my post on Friday, I had a think about what I want to paint next for the Challenge. I need to take a mental break from 30YW and 28mm Dark Ages figures, so I decided it was time to show my Swiss some love. 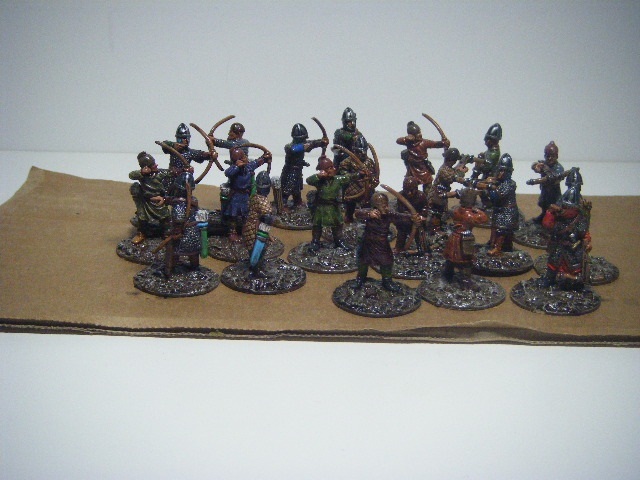 I got the figures out from the box and made a start on prepping them bu drilling the hands of the pikemen. 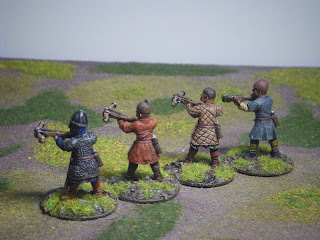 I will almost certainly be ordering the rest of the figures I need to complete the army before the Challenge finishes. 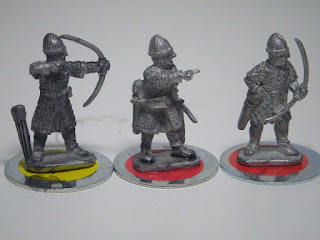 I might be able to save some money by ordering Donnington's starter army, but would want to check some details and would definitely need to order some extras. If everything had gone to plan, I'd be in a pub (or restaurant) in Abergavenny right now, before taking an early night ahead of the doubles tournament in Usk tomorrow. And then there was snow. And not just a smattering of it - apparently roads in and out of Abergavenny are not suitable for driving unless you have a 4WD or similar. So, we've decided instead to head off for Usk very early tomorrow morning and hope that the roads from Usk to Abergavenny will be clear enough for us to get there in the evening (otherwise we'll be desperately scrambling to find another hotel for the night!). On the brighter side, my copy of the V2 rules for FoG:AM arrived this morning. I would normally have posted this tomorrow, but as I'll be away I'm posting it tonight. These are almost finished now. The only bits left to paint are collars, plumes and metalics. 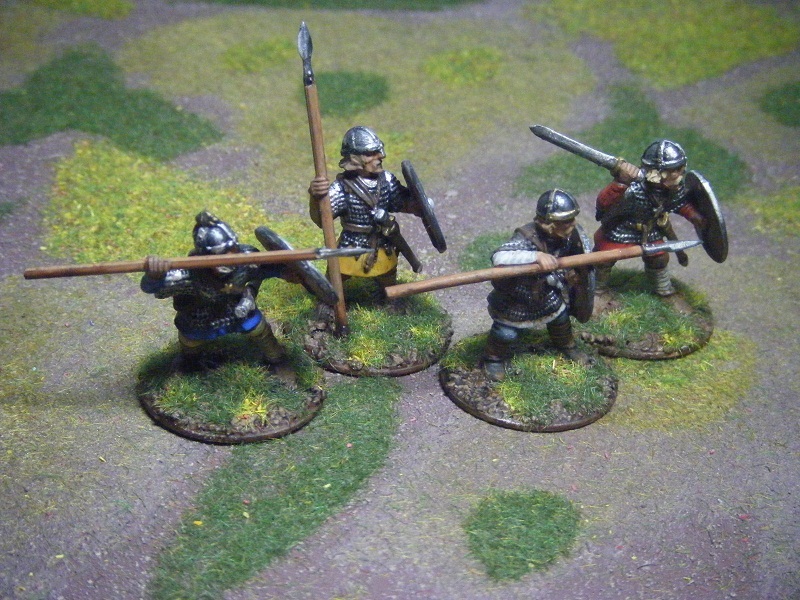 I've put these on hold for the moment as I'm picking the remaining 6 figures for these units up at Usk. As I had a few bonus hours due to my travel plans being cancelled, I made a start on these. They were black-primed the other day. 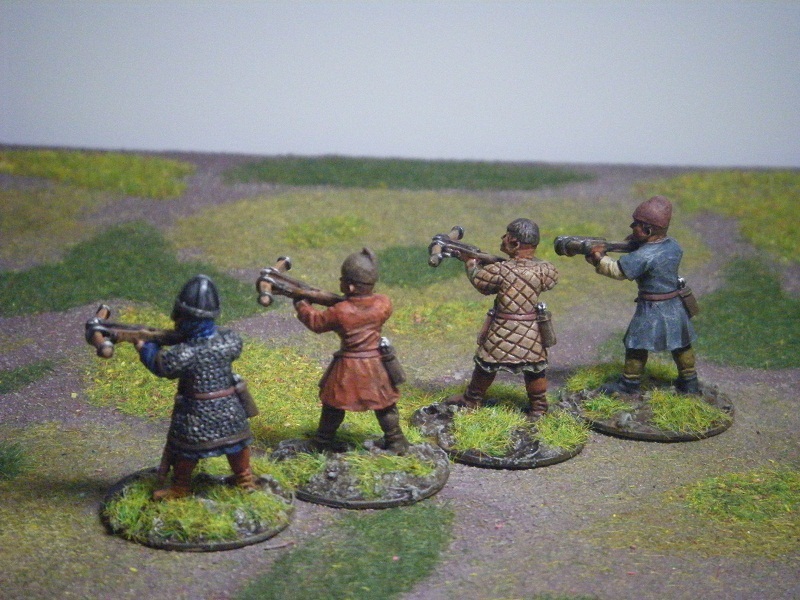 First off I gave them a heavy dry-brush (nearly a "damp-brush") with Tan Earth, followed by a light dry-brush with Pale Sand. The idea is that this should provide natural highlighting underneath thinned down paint. I've tried the opposite in the past - primed white and then given a dark wash, but found that it didn't work quite as well as it should have. 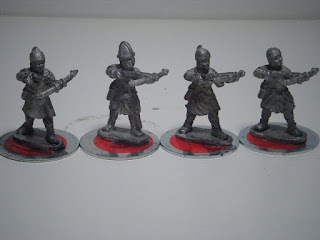 Priming black and then dry-brushing however seems to have worked really well (although perhaps the Pale Sand was a bit too light). I think these will probably be submitted for the Challenge before the 30YW Horse. Just after midnight I took the names of all those who had entered the prize draw, bunged them in a spreadsheet and was flabbergasted to see that there were exactly 36 names. Good heavens - that would make doing the draw dead easy. Just roll 2D6 of different colours and Robert's the brother of one of your parents. However, all good plans must surely falter on first contact with the enemy. In this case the enemy was a prolonged bout of sneezing, after which I'd forgotten which colour dice was for which column on the spreadsheet. That left me in a quandary - was the winner A or B? Do I reroll the dice? I did reroll the dice and amazingly got exactly the same result - a 6 and a 2. Clearly fate was telling me something. I soon figured it out - the prize draw was to celebrate my blog's birthday and having reached 300 followers. The solution was obvious - there would be two prizes and 2 winners. Please contact me to discuss what you want me to paint for you. You may recall from my post on Sunday that I'd placed an order that evening for some sprues and figures from Conquest Games. Well, they arrived this morning. 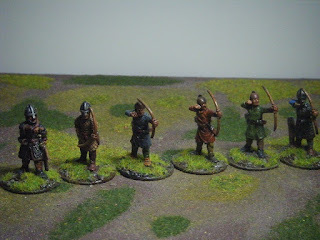 The two packs I'm reviewing here are the archers and the crossbowmen. These are 28mm metal figures - I don't know if Conquest are planning to release plastic Norman skirmishers. I don't think they will as the demand for them is probably too small for it to be worthwhile. However, I think it would be useful if they could do a skirmish weapons sprue with bows, crossbows, quivers and appropriate arms. The figures come in blister packs. Figures are 28mm foot to eye, 31-32mm foot to top of (bare) head. The casts are crisp and clean with no mould lines. 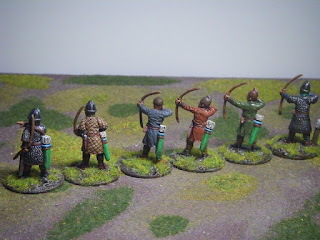 The only flash I found was a tiny amount on the crossbowmen. 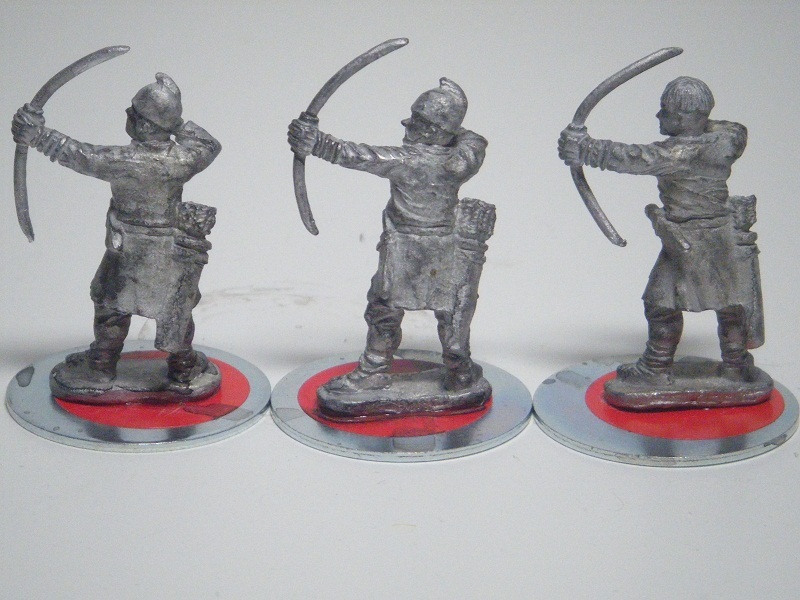 Four of the crossbowmen come with the crossbows as part of the sculpt; the other 4 are in firing stance and have open hands to accept the separate crossbows. Detail and posing looks good, although I am concerned that the hair texture may be too "soft" and will be obscured once primed and painted. 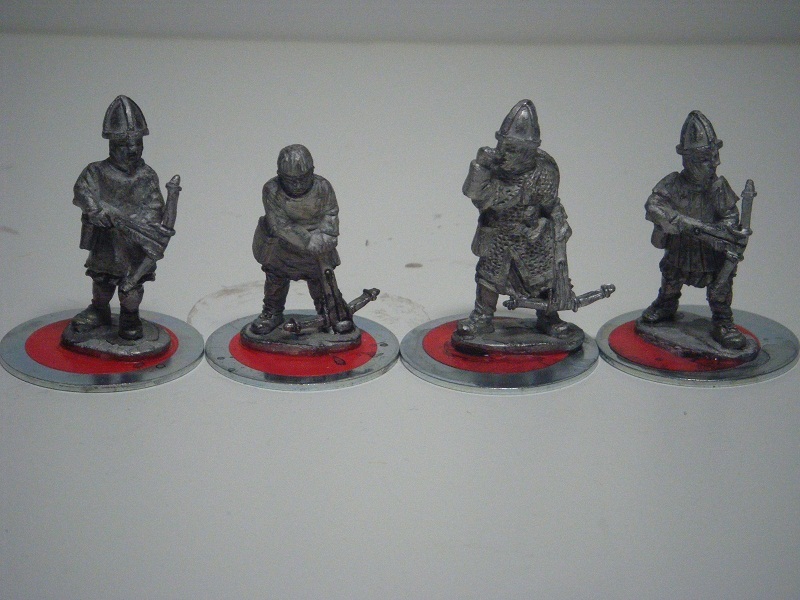 After giving the figures a quick wash in warm soapy water and drying them, they were glued onto 25mm metal washers. Once the glue had set, they were given a black wash to bring out detail before I took pictures. 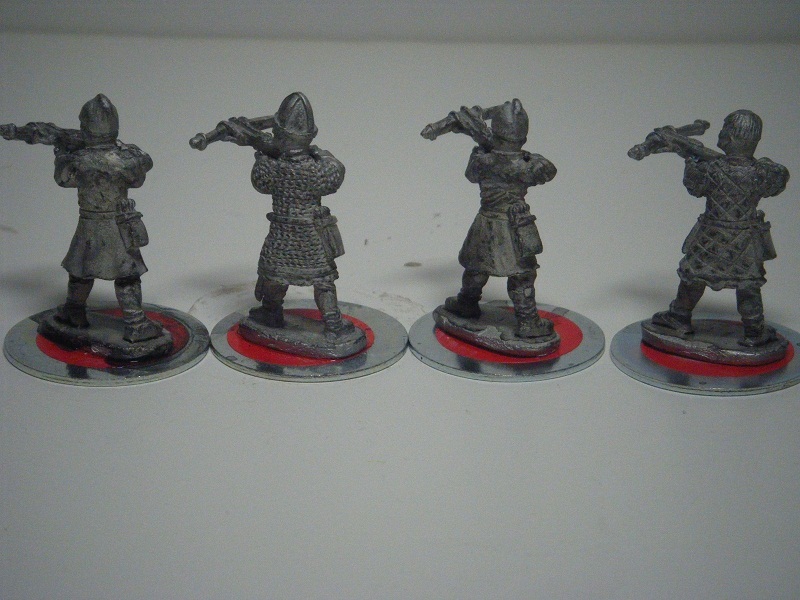 These are nice figures, well sculpted and excellently cast. At about £1.75 a figure, they're not as cheap as plastics but for Saga you only need a few of them. Delivery was very quick, which is always good, and my order was well packed. My views above are based on the unpainted figures - once I've painted them up, I'll give a final verdict. 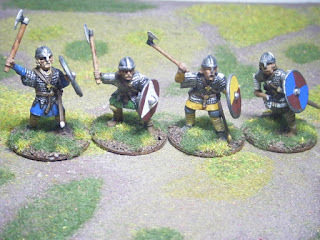 Pics of my Saxons went up on Curt's blog last night (link to post). 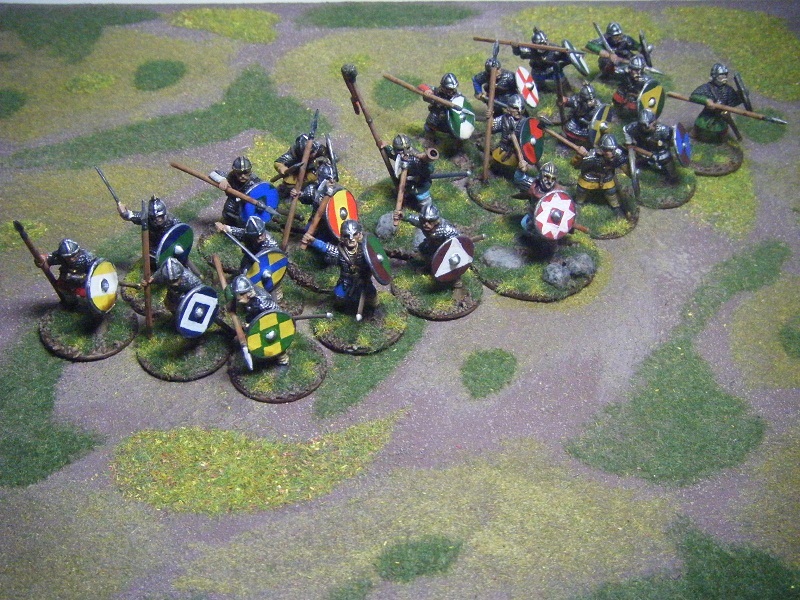 The 22 figures gave me a base score of 110 points, plus a bonus of 21 points for the hand-painted shields (the standard bearer was shieldless), for a total of 131 points. That boosted me to 12th place between Ray in 13th and Fran in 11th. The question which is the clown and which the joker? 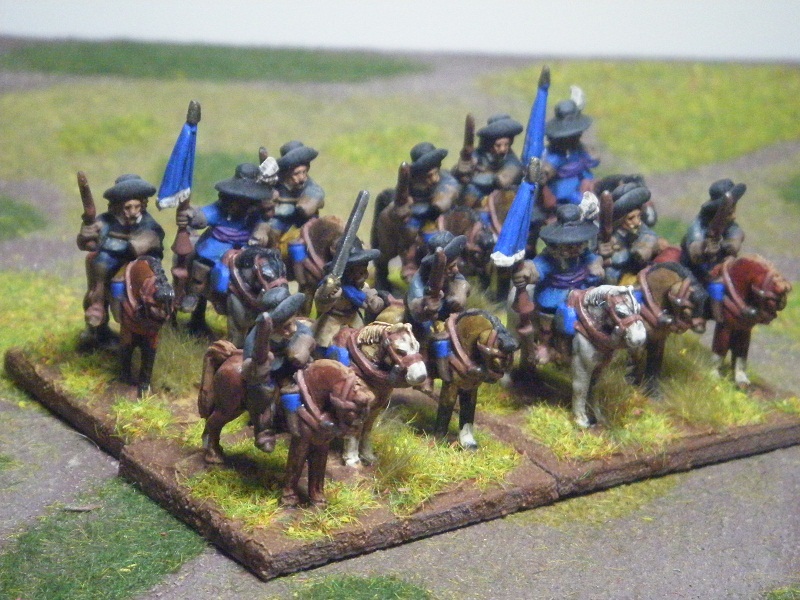 Before I sate your lust for mini-pr0n with pics of 28mm Saxons, a quick update on the late 30YW horse. After posting here last night I did get the washes done. 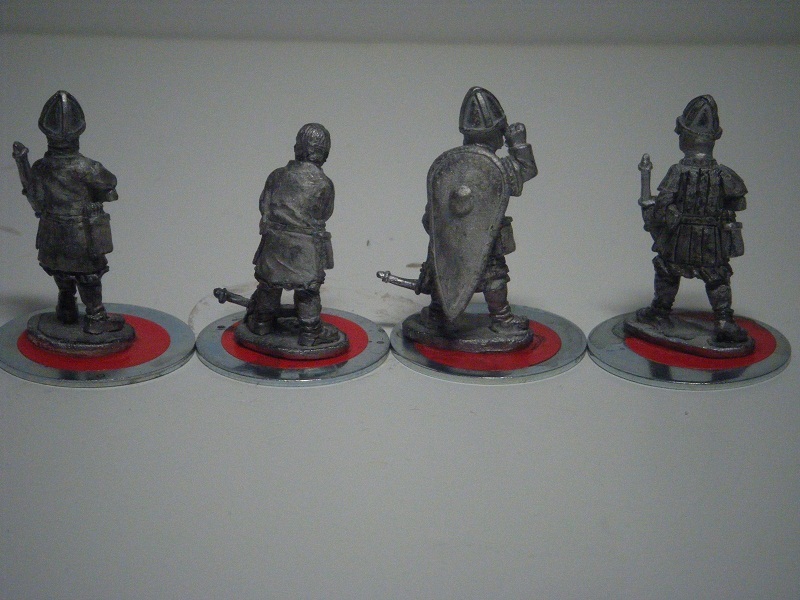 I also applied a black undercoat to metalwork (flagpole finials, pistol barrels) then dry-brushed with Bronze or Oily Steel as appropriate. 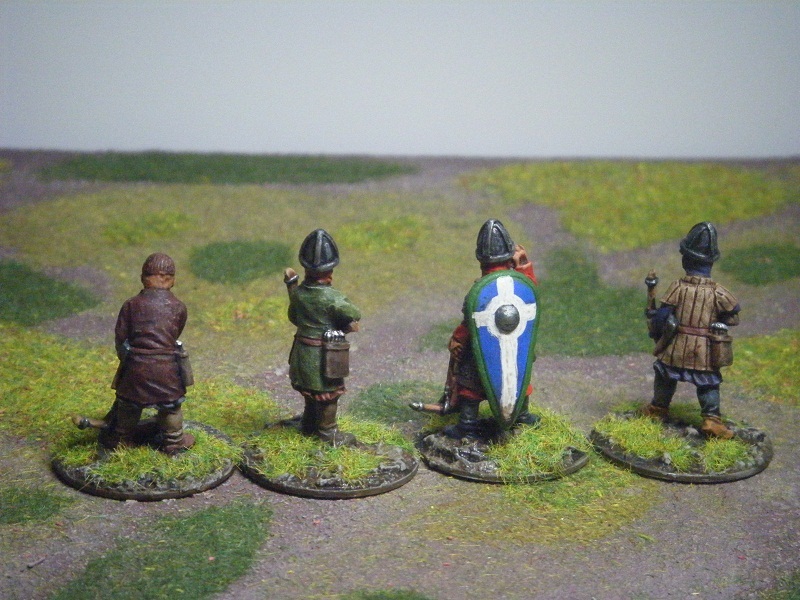 This evening I have done the saddle cloths (Gold Brown) and the wood (pistol stocks, flagpoles). I'll probably do the holsters and flags before I go to bed, maybe the horse markings as well.I doubt that I'll have finished these before I go to Usk for the tourney and I can't do the basing until I've got hold of the other 6 figures and painted them so it may be a little while before my next entry for the Challenge. And here they are. Can these Soft Southern Saxons defeat those Naughty Norsemen? Only time will tell. 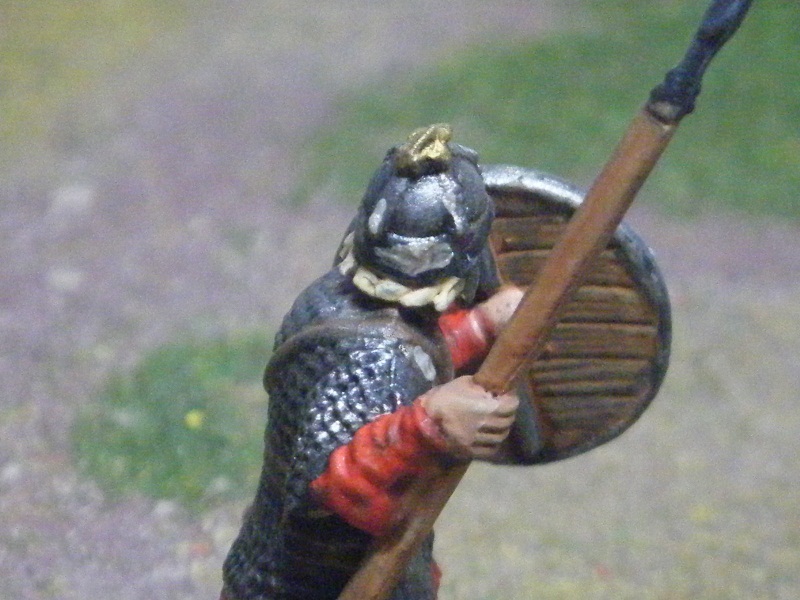 A close up to show the rear of the shield. 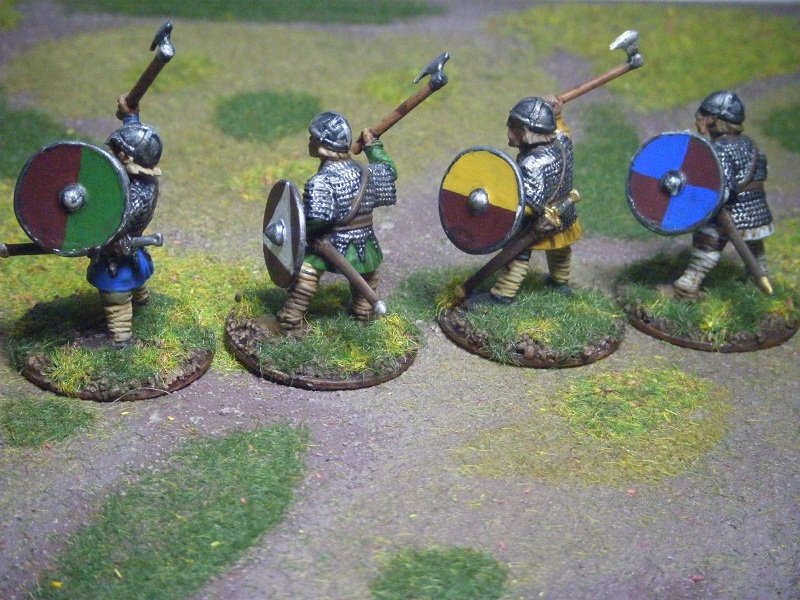 I like the way the wood came out (more obvious here than on spear shafts and axe handles). This came out from a basecoat of Cork Brown, my Brown "magic wash" and the Klear/ink coat. I started these from a white primer with a black/brown wash for pre-shading, which in retrospect was a mistake. I think I might have been better off doing a black primer then dry-brushing with white as the colours on the clothing came out rather brighter than I'd intended. I'll give that a go when I do the Normans. There's still a couple of hours left to enter if you haven't done so already. I'll be posting the winner tomorrow evening. Last chance to enter my prize draw! I'm still grotty with my cold, but not as bad as I was over the weekend so I should be back at work tomorrow. However, I had something to cheer me up this morning - Anne has posted pics of mini-me on her blog, and a wonderful job she has done too. I really love the back-story she's written for my avatar for her story arcs and the figure looks absolutely "me". 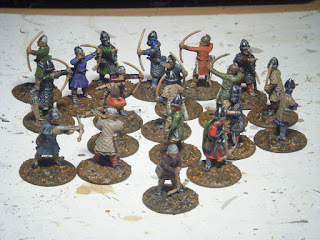 It also meant that I was able to throw open the windows to provide ventilation for doing the matt spraying of the finished Saxons (and to clear out some of the fug from my flat). 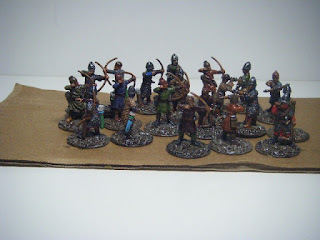 Once the figures were sprayed, I was able to get on with flocking the bases, take some pics and send them off to Curt - hopefully they'll be up on his blog this evening. 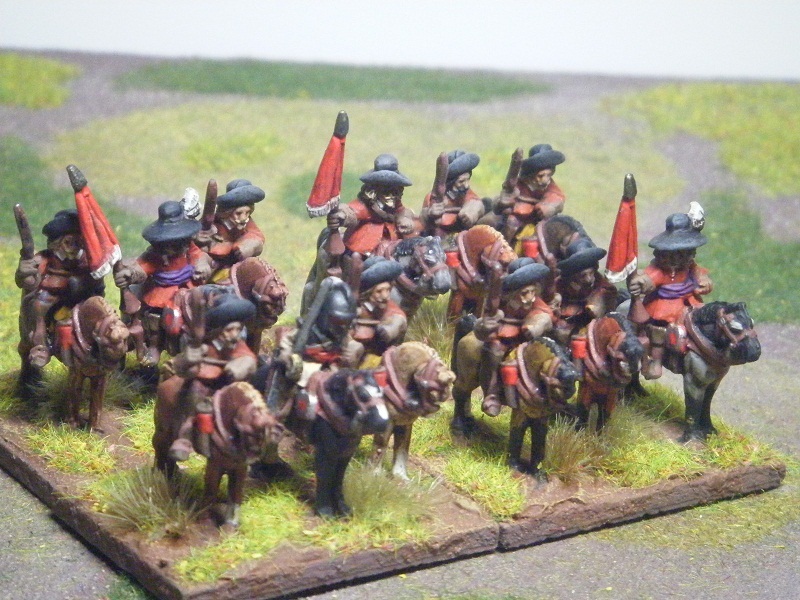 I've done the base colours on the horses and the manes, tails, cannons and muzzles (as applicable) on the bays. greys (OK, blue roans), the creams and some of the chestnuts. 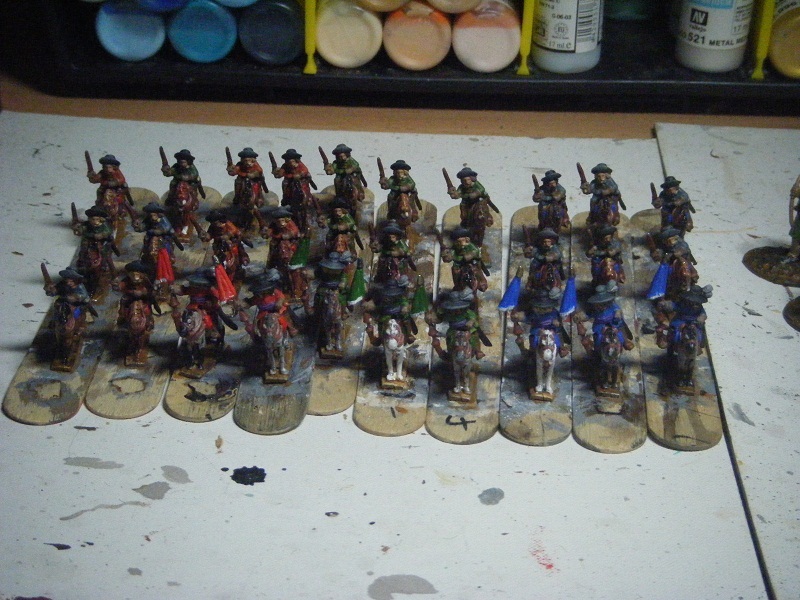 Later on I'll do the washes and possibly the riders' trousers. I've ordered some extra figures to make up 3 regiments of these - I needed 2 more troopers, 1 more standard bearer and 3 officer-type figures. I also ordered some Finnish "Hakka Pelli", some more harquebusiers/reiters and some regimental guns. 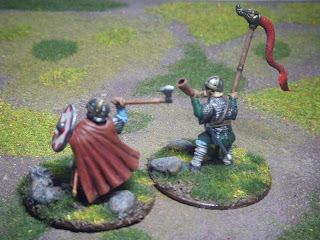 I should be picking them up this weekend at the tournament - Damian from Donnington Miniatures is taking part and I could even end up playing against him at some point. 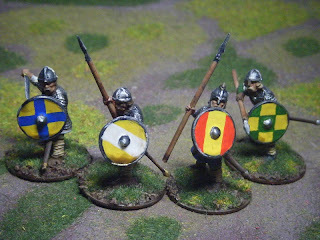 I've finished painting them, including some (imho) rather natty hand-painted shield designs and I've done the Klear coat. As with the Vikings, I used neat Klear on the shields, but used my Klear/ink mix on the rest of the figure. Now I've just got to wait until I have time in the morning (not to mention courage - it's bleedin' cold right now) to throw open the windows and spray them with matt varnish. Once that's done, the tufting/flocking should be a quick process and then I can send the pics to Curt for his blog, wait 24 hours or so and post them here. 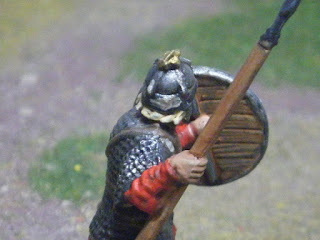 With work on the Saxons in abeyance until I can matt spray them, I made a start on the 30YW horse. 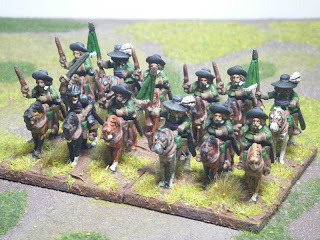 All I've done so far is to whitewash the horses. 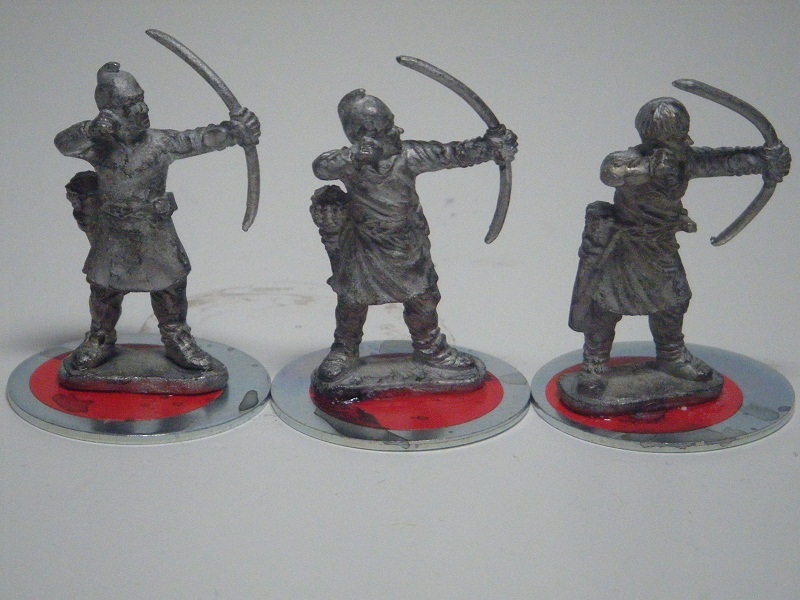 With these I'll be doing a lot more greys, blacks, chestnuts and duns as I'm heartily sick of bays! For the riders, they'll be much more uniform than normal - buff coats, black/grey hats and just one colour each used for gloves and boots. I might even use the same colour for all the breeches. 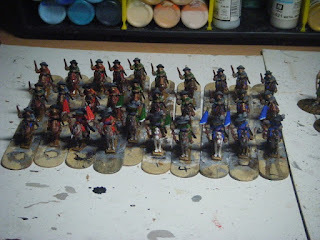 Tomorrow evening should see the horses getting their base colours and the washes if I have time. "Sector Fleet" - a Traveller supplement from Mongoose. As a teenager, Traveller was one of my favourite RPGs and I've always had a thing about space navies so this find was impossible to resist buying. I'm slowly reading through it and there's plenty of information for developing campaign backgrounds and doing fluff for fleets in other universes. Simon and I had been hoping to get another practice game ahead of Usk for tomorrow night, but we haven't been able to find opponents. Hopefully our one-and-only practice game (see my AAR in yesterday's post) will be enough to see us achieve 2nd-to-last place in the tourney. That's right - 2nd-to-last. We're aiming high! Only a few days left to enter my Prize Draw! I had been hoping to have finished the Saxons in time to post them this weekend, but life has got in the way. Microbial life that is. I hadn't been sleeping well since last weekend, which told me that I was probably fighting off an infection. That left me feeling absolutely knackered all week so I got very little painting done. Anyway, the cold finally broke yesterday and the tiredness seemed to go with it, but has returned today. So, yesterday I made good progress with the Saxons, in between the expected bouts of coughing, sneezing and nose-blowing. 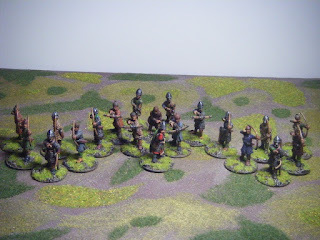 I've done a bit more today and should have finished the painting by tomorrow evening, but it may be a day or two before I can finish the basing and post photos of them. I've also been prepping the 30YW "horse" and managed to prime them with Gesso this afternoon. I'll probably be able to make a start on painting them on Monday evening. I've booked 5 days off work - this coming Friday (for travel to Usk for the FoG doubles tournament) and the Monday to Thursday of the following week, so I probably need to prep some more figures. I think that the next batch will be some 28mm Normans - I've yet to decide whether it will be foot or some knights. Dave and Andy kindly agreed to give myself and Simon a practice game for the doubles tournament. 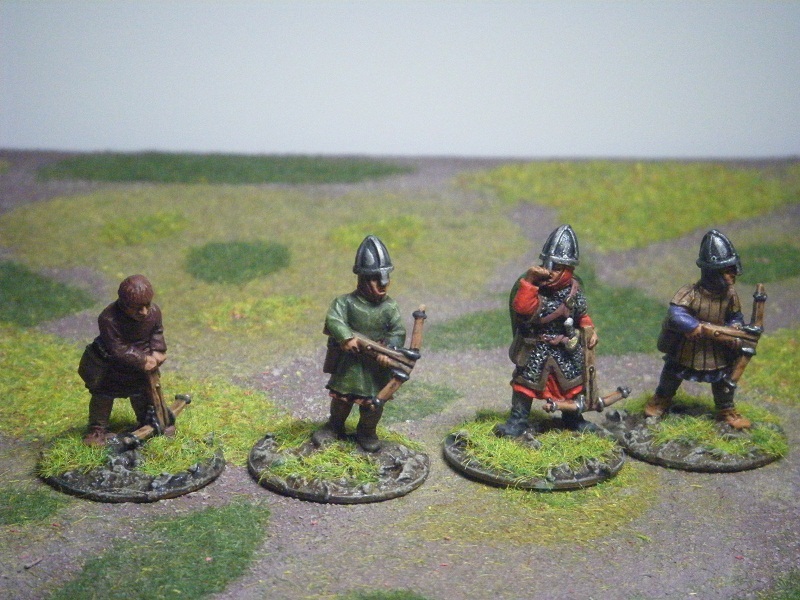 They were fielding an Early Ostrogothic army with Early Vandal allies (mostly impact heavy foot) against our Early Alans, so a potentially historical match-up. They won the initiative and opted for agricultural terrain (so at least Simon and I were able to select two pieces of "open" terrain). Both armies deployed - all the terrain is open fields apart from the steep hill on our left flank. The Early Alan line - non-skirmish troops can now deploy 12" in rather than 10"
Our opponents' right wing - notice the foot on their left? Rather tempting, eh? Eh? 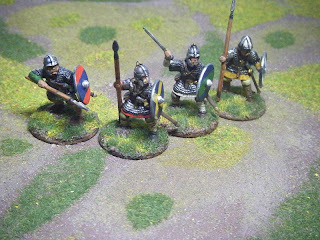 The Vandal allies with some more Ostrogoths. Dave and Andy deployed in two blocks with a gap between them. Unfortunately for us, most of their initial deployment was on their left wing, with the right wing going down later, which made our deployment more awkward. With hindsight, we would have been better off deploying more heavily to our right, to take on their left wing, leaving just a blocking force to slow down their right wing. We kind-of-did-that anyway, but from a less ideal position. That makes a big difference compared to V1, where generals can move as many battle groups that are in edge-to-edge contact as are in the general's command radius. In theory (if 14 of them are in column), a TC *could* move up to 16 BGs as a single battle line. Not that you'd want that many BGs in column as a massive block. Another major difference in V2 relates to shooting by mounted and light foot bowmen. 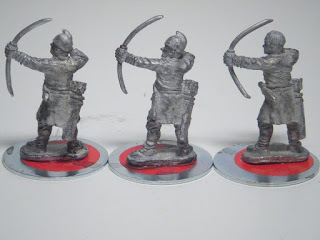 The effective range has dropped from 4" to 3" for light foot, light horse and for cavalry in single rank (bow cavalry in 2 ranks still have a 4" effective shooting range). 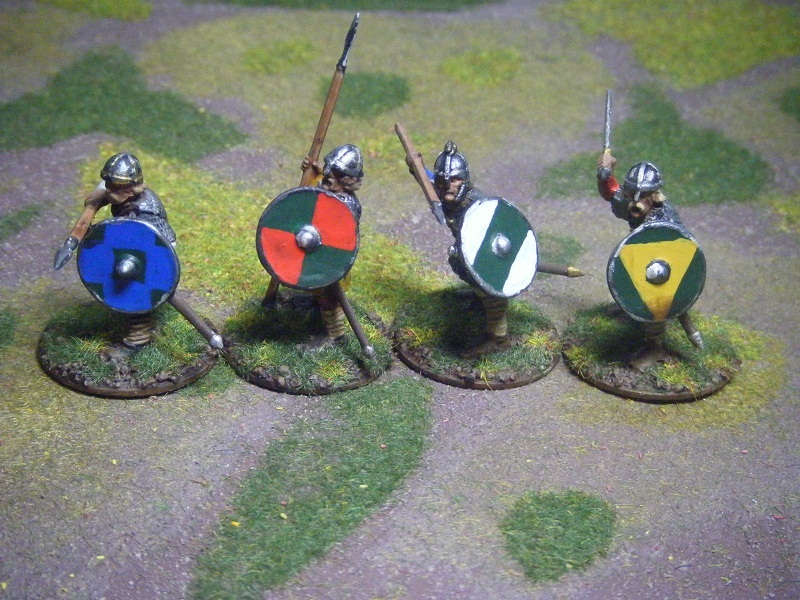 There are two changes which could help make armies like the Early Alans more viable. 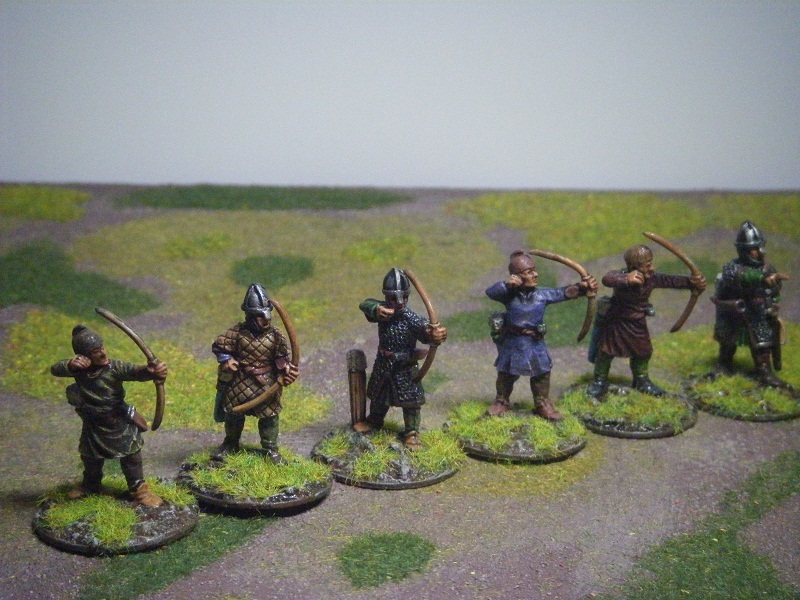 The first is that protected cavalry in 2 or more ranks are less vulnerable to shooting - only longbows and crossbows get the + POA for shooting against them (in V1 longbows, bows, javelins and slings got the + POA). the second is that when they are in single rank, they can (if they pass a CMT to do so) turn 180 degrees, retire and turn back 180 degrees, just like light horse. However, the distance of the "retire" has dropped from 3" to 2". 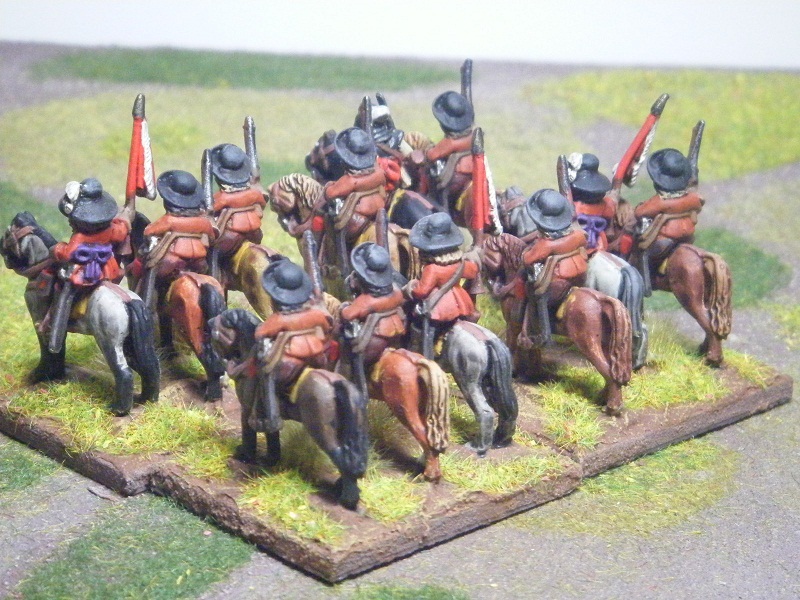 The combined effect of the reductions in effective shooting range and the turn-retire-turn mean that there is a greater chance of skirmishing cavalry being caught by charges. A further change that will help a lot is to the rules about rear support. In V1 the supporting bases providing rear support all had to be directly behind the battle groups they were supporting. In V2 this has changed and bases adjacent to those directly behind also count towards the number needed. Well, that's enough of the rules changes for now. Back to the battle. As I said earlier, we did kind-of divide our army into a blocking force on the left wing and an attacking force on our right, but should probably have committed more troops to the main attack. 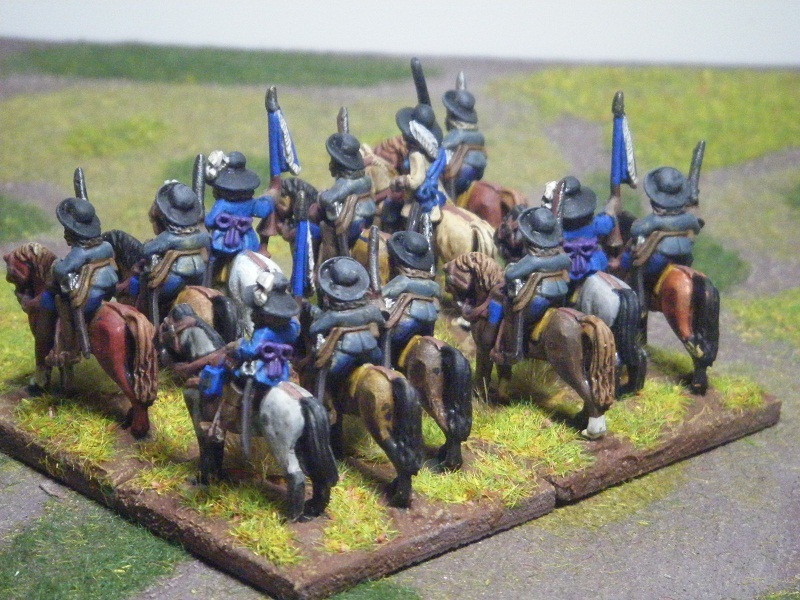 Now I sit down and look at it, I've realised that the only difference between our forces was that I had the light foot BG - we both had 3 lancers, 2 shooty cavalry and 2 light horse. Perhaps I should have pinched one of his lancers and maybe a shooty cavalry? 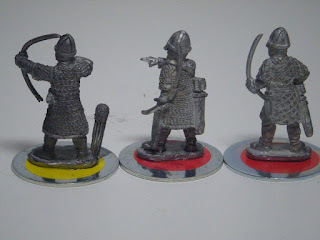 As the more experienced cavalry commander (Simon is used to commanding a Pyrrhic army which is mostly heavy foot pikemen) I took the attack force. My plan was to overlap and turn the right wing of their left wing (if you follow my drift) whilst holding up the left-left wing with m light horse and shooty cavalry. Unfortunately crap dice, the aforementioned traffic management problems and only having 2 TCs to move my force caused things to go less well than I'd hoped and I was only able to get two of my lancer BGs into the attack at first. Meanwhile, our blocking force were also suffering from some traffic management issues, but so were their opponents (which included a BG of Superior Alan light horse! How the heck do they get superior Alan LH, when the Alans themselves can only have Average LH? Harrumph!!). 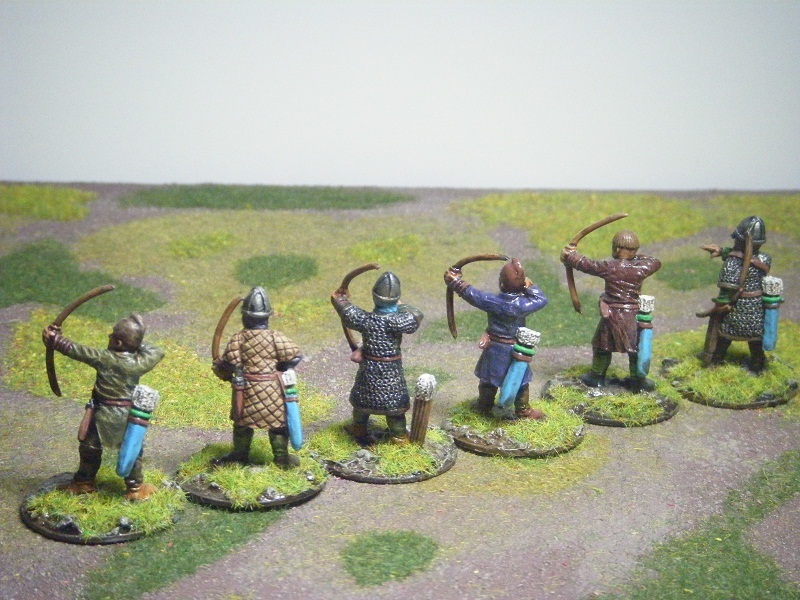 Their right wing did have a very tempting target for our lancers though - 2 BGs of unprotected medium foot bowmen in the open. One BG of lancers charged the archers on the end, whilst another fended off the Ostrogothic lancers. 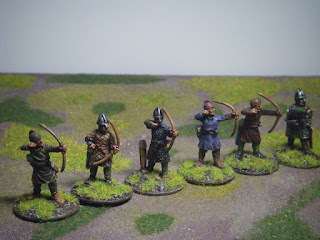 "Errmmm, aren't average unprotected medium foot bowmen in the open supposed to crumble when charged by superior armoured lancer/swordsmen?" Lancers versus medium foot in the open - should be a walkover, shouldn't it? Hmmmm, that unit repulsed the lancers not once but twice and it was only on the third charge that they finally got destroyed. Back over to my attack, where my skirmishers were doing their job of teasing the impact heavy foot and hid left-left wing cavalry. 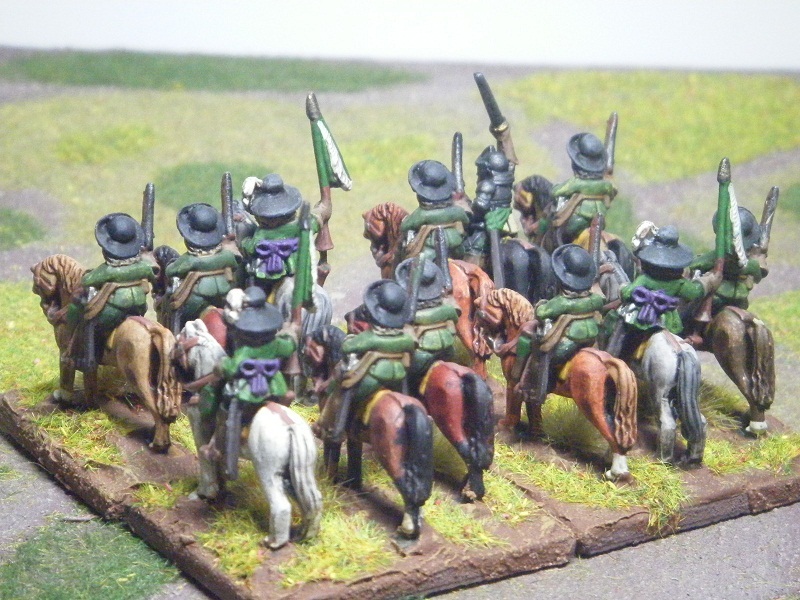 Unfortunately my shooty cavalry were suffering a little from some poor positioning which meant only one of them was able to expand into single rank. The other one was stuck in 2 ranks and was therefore unable to evade when his foot charged it. If I'd had the space, I would have turned them 90 degrees and wheeled them back to face the foot but a little further over. Mind you, the one which had managed to expand only just evaded to charge by a cigarette paper! My lancers were having a hard job turning hid right-left wing as their opponents were almost an even match. the melee dragged on for ages, but eventually one of their lancers buckled and broke, allowing mine to turn in for a rear-charge which broke the other, leaving my lancers in position to attack one of his impact foot BGs (which had turned 90 degrees to face and was therefore in column) frontally and in the flank. 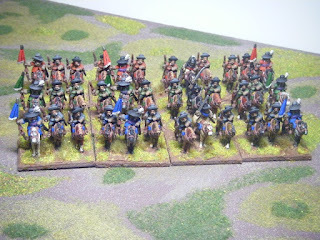 The 3rd lancer BG in my force had just broken having been fragmented by the impact foor it was fighting and then being charged in the flank by some Ostrogoth cavalry. Back over on the left, one of their lancer units had decided to sneak around the steep hill to try for a home run against our camp. All that Simon had available to send against them at that point was a light horse BG. This proved to be of similar quality to those damned medium foot bowmen - at one point having lost a base and having dropped to fragmented (so it only had one dice in the melee) it managed to win a round against 4 bases of steady cavalry (= 4 melee dice), which had the advantage in armour so needed 4s against the 5s the LH needed. Oh, and the LH had managed to kill the Ostrogoth cavalry's general! We called the game at about 10.20pm as that was roughly where it should have finished under tournament rules. Surprisingly we had won, but would have caused our opponents to rout in the next turn as they were just 3 points away from breaking - we were about to take their camp and break another BG. I think we had lost 3 BGs broken and had one fragmented. Simon's blocking force accounted for most of their losses, whereas most of ours came from my side of the battle. It was a tense and exciting game and we all learned a lot from it. Not to forget, it was a win for myself and Simon!